The first contribution toward building a checklist of souvenir buildings / monuments / statues located in Los Angeles or Orange Counties has arrived. Chris S. sent in this photo of the ARCO Center, ARCO Products Company Headquarters. He wrote, “This Arco Tower was a spec building built in the late 1980s prior to the office building bust in the 1990s. This was the ‘lesser’ ARCO building, not the more famous ARCO Tower that housed the oil company headquarters. This building housed the ARCO Products Division, the AM/PM Mini Marts. ARCO has ended their lease and taken the signage off of the building.” He speculates that this miniature was made as a souvenir for the initial occupancy or as a sales reward. Chris found it at the Mart Collective in Venice, CA in the fall of 2014. Stadhusett – Stockholm (City Hall – Stockholm), Sweden, height – 3”, Cast Metal. Sticker on bottom reads, “Washfobik, Konsthantverk, Varby, Sweden.” The City Hall was designed the National Romantic style by the architect Ragnar Ostberg and was completed in 1923. Kungliga Slottet – Stockholm (Royal Palace), Sweden, height – 1 1/8”, Cast Metal, Maker unknown. Since completion in 1774 it has served as the official royal residence of the Swedish Royal family. Steven C. and son, Ethan C., returned home from Nashville with lots of great additions to their collection of souvenir buildings and monuments. Check out these photos! Tecumseh Monument, Naval Academy, Annapolis, MD; Polar Circle (Polarcirkel 1937) Monument, Norway; St. Pauls’s Cathedral, London; Shrine Peace Memorial, Toronto; Lucy the Elephant, Margate, NJ; Ricordo Di Padova; Temple of Saturn, Baalbeck, Lebanon. Peace Arch Memorial, US-CN border, Blaine, WA & Surrey, BC; Fountainhead Chiropractic Hospital, Davenport, IA; Tower of America, 1968 HemisFair, San Antonio, TX; Lighthouse, Portland, ME; Sacre Coeur, Paris; Irish Cottage. Fountainhead Chiropractic Hospital, Davenport, Iowa. Winged Victory of Samothrace, Louvre, Paris (Nat’l Fed. of Business and Professional Women’s Club); State Capitol, Montgomery, AL; Trolley, San Francisco; St. Peter monument, Vatican. And finishing off with a collectible Beer Tap Handle. SBCS’s 2014 Convention is over. There were some good souvenir building and monument finds associated with the attendees’ travel, Nashville antique-ing, SBCS swapping, raffle and auction. Here are the first pictures sharing some of the take-homes. Carolyn C. found the David sculpture, in perfect condition, at the “Big One” Nashville Flea Market on Friday. She was happy to grab it for $15. Washington DC cityscape, 4 1/2 inches tall, made in Japan, makers mark – Initials KT in a circle with wings, MM #246. Many attendees left Nashville with a pocket full of refrigerator magnets that featured buildings and monuments. They were a final gift to members of SBCS from Pat Smith, who passed away earlier this year. New York, Asturias, Maltese House, Wells Cathedral, HaNoi, Ellis Island, Museo Chillida, Unknown, Quebec CN. SBCS President, Joe K did quite well and sent the following pictures of the loot with which he returned home. Top row – Capitol Records 45 record sleeve (great graphics); Singing Tower – Lake Wales FLA; Knox County Court House; plastic Sunsphere, Knoxville, TN; Jefferson Standard Life Ins. Co., Greensboro, NC; R do Sevilla; Park Bank thermometer; United Nations cup & saucer. 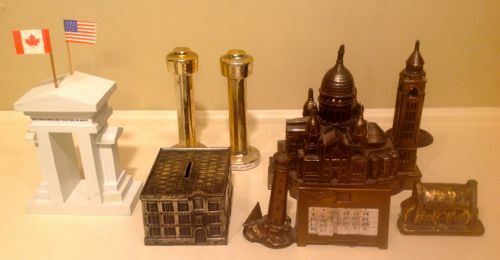 Bottom row – State Capitol, Harrisburg, PA (ceramic bank); Royal Manchester Exchange (porcelain box); Steamtown – Bellows Falls, VT (ceramic bank); Castillo De San Marco; The Hermitage (metal letter holder); Pikes Peak or Bust (S&P metal tray). We spent a day in Prescott, AZ. Took a tour of the Territorial Governor’s Mansion at the Sharlot Hall Museum in the morning. Meandered through the antique stores in the afternoon. Found a bronze miniature of the Governor’s Mansion cast by Noggle Bronze Works for the 1864 – 1964 Centennial of Prescott as the Territorial Capital. It weighs 3 and 1/4 lbs, is 2 3/4″ in height, 7″ in depth, and 5 inches wide. Hello, folks. I thought you might like to see some of the current souvenir buildings offered at Central European tourist destinations, and some older ones we found in antique shops and flea markets. We spent a month in Germany, Czech Republic, Austria and Hungary. We visited Munich, Prague, Vienna, Budapest, as well as Salzburg. On a cruise up the Danube we visited Melk, Linz, Passau, Regensburg and Nuremburg. We also visited Rothenburg and Newschweinstien. A photo of the souvenir buildings we collected is attached. Some are produced in metal, but resin predominates. Here’s the list of what we found. 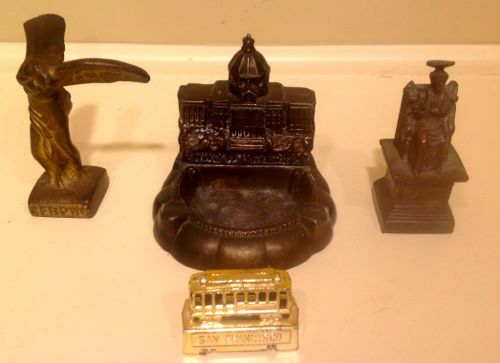 Harry M.
On the front row, the Egyptian ashtray I found at the Escheri Flea Market(thanks to Bob Curtiss rec) in Budapest along with the 3 Russian buildings on the back row (large silver metal and 2 glass ones). The St Stephen’s Basilica from Budapest is sandstone. The next 3 are St Stephen’s Cathedral in Vienna – the first plastic sold in the bookstore of the cathedral and the other 2 metal found at street vendors. Then the resin Schonbrunn Palace from Vienna. On the back row, the first 5 are all metal – the first 2 are the Petrine Hill obs tower (Prague’s Eiffel Tower), the next one is the Astronomical Clock from Prague, and then 2 versions of Budapest’s Liberty Statue (only saw these at one high end gift shop right across from St Stephen’s). Next are the 3 Russian pieces and then one we got for our son in Amsterdam on our layover flying home. Hope everyone is doing well! Looking forward to seeing everyone in Nashville in October! Heading to Helsinki, Tallinn, and Riga in June. Welcoming any tips on these cities. Steven C.